Together takes classic jewellery concepts and recreates them using a unique alloy of bonded silver and 9ct gold. 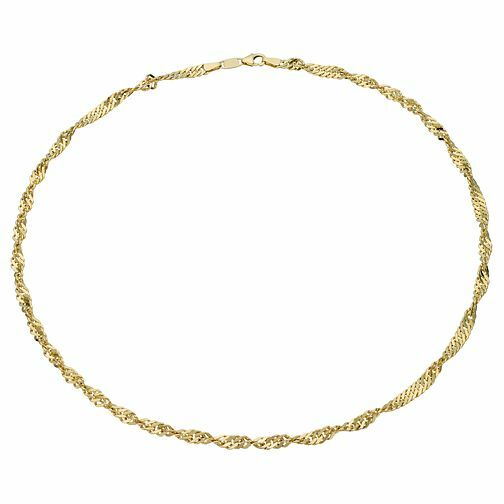 This beautifully crafted 18" Singapore twist necklace is an easy to wear, everyday piece, designed to deliver effortless chic. Together Bonded Silver & 9ct Gold 18" 70G Singapore Necklace is rated 4.5 out of 5 by 2. Rated 4 out of 5 by Anonymous from Excellent customer service The Singapore bonded gold necklace is very beautiful and seems just like solid gold. Quality seems very good, lets see how it will be after 6 months of use. I didn't realise how shorf the necklace would be when I ordered it. So I think the measurement should be more boldly displayed on website. However the customer service was very good and they corrected the isue. Delivery was prompt.